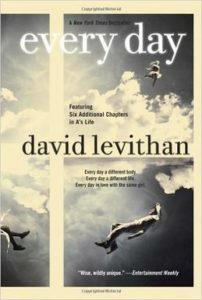 Our last mother-daughter book club pick of this year was Every Day by David Levithan. This isn’t the type of book I usually read, because it’s sort of sci-fi/fantasy, but I am definitely glad I did because I enjoyed it quite a bit. The narrator of Every Day is A, a 16 year-old boy and/or girl who wakes up every day in someone else’s body. (In this review, I am going to use “he”, but he is sometimes a girl and sometimes a boy). He has never lived more than one day in the same person’s body; at midnight every night, he finds himself someplace else. When the 24-hour period is up, the person whose body he has inhabited “wakes up” and remembers some of what occurred during that day, but not what s/he was thinking or why s/he acted how s/he did. When Every Day opens, A has inhabited the body of Justin, a 16-year old boy in Maryland who’s pretty much a jerk. He mistreats his girlfriend, Rhiannon, and is generally unpleasant, selfish and insensitive. A, however, falls in love with Rhiannon. A (as Justin) and Rhiannon go on a date, where he is tuned in, affectionate and emotionally open with Rhiannon, and they connect in a way that Justin and Rhiannon rarely do anymore. At midnight, of course, A takes up residence in someone else’s body, while Justin goes back to his boorish ways. The rest of Every Day is about A’s relentless attempts to get back to Rhiannon. He commandeers his hosts (all of whom live in Maryland as well) and spends every day finding ways to get to her town and interact with her. Eventually, he confides in her about who he is, letting her into a world that he has shared with no one since he was born. His is a very lonely existence, and his connection with Rhiannon is the closest thing to a relationship that he has ever experienced. Of course, for Rhiannon, it’s immensely frustrating; she’s in love with a person (a boy? a girl?) whose presence is entirely unreliable and ever-changing. 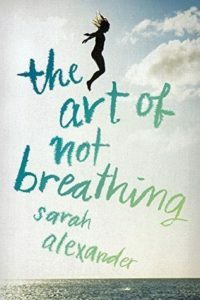 Along the way, there are poignant chapters where A ends up in the body of an immigrant housecleaner, a suicidal girl, a home-schooled boy who takes care of his siblings, and on and on. The only constants are A’s email account, where he takes notes about where he has been, and his feelings for Rhiannon. Every Day is a clever and compelling book. I usually avoid plotlines that are not realistic, but this one captivated me. I really felt for A and the bizarre predicament he was in, and I thought Levithan’s exploration of the permutations and ramifications of A’s body-snatching – both for him and for his hosts – was really well done. This is YA fiction, but I liked it a lot. It’s no surprise that A is 16 years old, given the audience for the book. (I’d love to see a forty-something version!) The love shared by A and Rhiannon is a little shallow and a little quick, but again, it’s YA fiction. I liked the broader messages about acceptance of differences and the importance of seeing life through other people’s eyes. Unfortunately, not too many people read the book before our meeting so we didn’t have our usual robust mom/daughter discussion this time, but the few girls who read it liked it a lot. There is also a sequel, Another Day, which tells the same story from Rhiannon’s perspective. Every Day was one of my favorite mother-daughter book club reads of the year, and I highly recommend it. Maybe a good summer reading choice for a teenager (or grownup!) with some time on his or her hands? Our mother-daughter book club read Sherman Alexie’s The Absolutely True Diary of a Part-Time Indian for our most recent meeting. It’s about Junior, a dorky teenager living on an Indian reservation who makes the unprecedented move of transferring from his reservation high school to an all-white school 22 miles away. Like most of the people who live on the reservation, Junior is very poor. He has attended 42 funerals in his short life, most due to alcohol-related accidents and diseases. His parents are loving, but his father is an alcoholic and neither parent is capable of providing Junior with much support, emotional or financial. 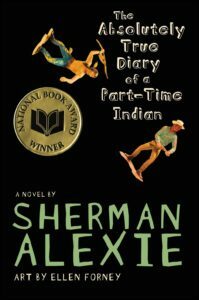 The Absolutely True Diary of a Part-Time Indian is about Junior’s attempt to fit in at his new school, among the rich white kids who have iPods and cars and three pairs of jeans, while maintaining his relationships back on the reservation, where he is deeply resented for his “desertion” of the tribe and pursuit of success. It’s funny, wry and very easy to read, but it’s not a light book. Alexie tackles racism, poverty, alcoholism, bullying, serious health issues and depression in the book, and it can be depressing. But Junior has hope that he can improve his life, and that he can rise above his childhood and succeed. He finds the good among the rich kids at the new school, and he forgives his old friends who turn on him when he returns to his old high school for a basketball game. He recognizes his parents’ limitations, but he loves them anyway. I really liked The Absolutely True Diary of a Part-Time Indian. It’s like Diary of a Wimpy Kid, just more depressing. Junior is a cartoonist, and the cartoons featured throughout the book are poignant and funny at the same time. The girls in book club were moved by the condition of the reservation and the lack of hope so many of its residents felt. They were struck by how few options Native Americans have to improve their lives. I recommend The Absolutely True Diary of a Part-Time Indian for a range of ages. Definitely worth a read. We had an April meeting on the calendar for our mother daughter book club, but due to busy schedules, we had to cancel. I decided to read the book anyway: Monster by Walter Dean Myers. Steve Harmon is a 16 year-old boy who is in detention in NY city jail awaiting trial. He has been accused of taking part in a felony murder – specifically, acting as the lookout for a drugstore robbery that ended with the owner being killed. As part of a way to deal with his stress and anxiety, Steve decides to tell the story of the trial and his incarceration in the form of a screenplay for a movie. He includes the dialogue and camera notes – close ups, flashbacks, etc. The screenplay format is an interesting way to tell this story, and it’s very effective in Monster. There is some ambiguity over whether Steve actually did what he is accused of, and the format of the book allows Myers to get away with not really resolving it. There are moments of first person narration in the journal entries that punctuate the chapters, but most of the book relates the courtroom proceedings as they happen. There’s a lot of stress in the book, as Steve talks about the violence in jail, his fears about his future, and the sadness he sees in his parents’ faces when they come to visit him. Myers did a lot of research interviewing inmates, and it shows. He includes a lot of detail about what it’s like to be young and scared in jail, awaiting your fate as a jury decides whether they believe you or what your lawyer has argued. It’s a difficult topic, to be sure, and I wonder how our group would have liked it. There’s also a bit of legalese in it, but not too much. I am definitely glad I read it, and I would like my daughters to read it at some point so that we can discuss it. 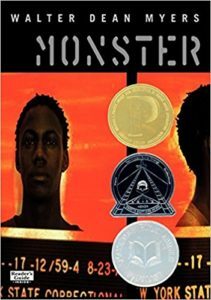 Monster provides a creative and compelling perspective on a world that most teenagers never experience. I found it to be a worthwhile read that made me think about my own biases and the conclusions I might have drawn were I in the courtroom – fair or not. 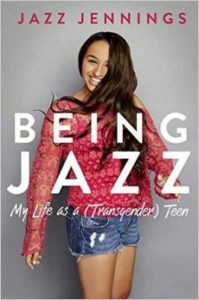 Our latest mother-daughter book club read was Being Jazz by Jazz Jennings. It’s a memoir by a 15 year-old girl who was born into a boy’s body. Jazz knew at an early age that she was transgender, and with the help of her accepting family, she transitioned by kindergarten. Jazz, who is now the subject of a TLC reality show, has become a well-known activist for transgender issues and has spoken around the country and received many awards. Sadly, Being Jazz was too superficial for me (and the rest of our book club). There is a lot of talk about her TV appearances and all the good she has done. Jazz is very grateful for all of the opportunities, and she doesn’t come across as entitled or arrogant, but there is just too much of that and not enough soul-baring. I wanted to know more about what it felt like to be in the wrong body. I wanted to understand gender differences from someone who can’t identify with herself physically . I wanted to understand more about how she related to boys and girls differently. Instead, I got a memoir by a teenager about her life as a celebrity. I don’t mean to knock the book too much, and I respect Jazz for her openness and courage in fighting for transgender rights. And I appreciated her honesty about her depression. But I wanted more of those things and less of the fights she had with her eighth grade friends. Being Jazz is well-reviewed, so perhaps I am being curmudgeonly. In the end, it was a bit of a trifle. It could have been much more than what it was, maybe with the help of a (different?) ghostwriter. Our December Mother-Daughter book club read was Booked by Kwame Anderson. It’s the story of Nick, a seventh grader dealing with the demise of his parents’ marriage, a crush on a classmate, a budding soccer career and bullying. What makes Booked interesting is that the story is told in verse. This style highlights Nick’s emotions and inner dialogue, which makes it all more poignant and genuine. What could have been a somewhat unremarkable litany of middle school woes becomes transformed into something lovelier. Nick’s father is obsessed with words – he even wrote a dictionary – and while Nick feels burdened by his father’s requirement that he read the dictionary, he too is a gifted linguist and finds power in expressing himself. He ends up joining a book club (because the girl he likes is in it) and finding some escape through reading as well. 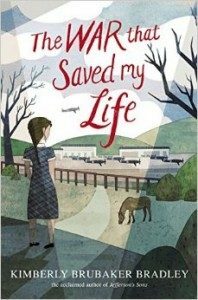 Booked was a quick and interesting read, and our group of 7th graders found enough to talk about – what role did the quirky librarian play? Were the adults in Nick’s life paying enough attention to what he was going through? How did the use of poetry change their feelings about the book? What was in the mysterious dragonfly box? In the end it probably won’t be our most memorable book of the year, but for the verse alone it was a good choice. We have identified a theme running through many of our book club books this year: kids being left to themselves to deal with some weighty problems, and adults generally being unaware and unhelpful. While this theme is a bit frustrating – we adults aren’t that bad! – it makes sense. How else to present adolescent protagonists who grapple and grow throughout the book? I am curious to see if this theme will continue into 2017.